A comprehensive handbook for MARC catalogers and a valuable learning resource for students. The book represents a subset of MARC21 fields delineating scope, content designations, interpretations and examples. The terminology and definitions used are in tune with MARC documentation, CCP, OCLC, AACR2 and ISBD. 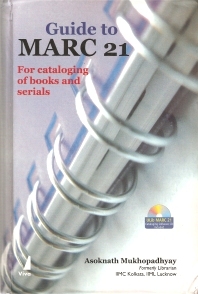 Based on updates to MARC, the book offers field- and subfield-specific interpretations of rules and provides many examples for the appropriate use of tags, delimiters and date renderings.The book also contains a detailed bibliography and webography, plus a list of gateways that provide authentic information sources about MARC-compatible library software, utilities, freely accessible databases of MARC records and online cataloguing norms and practices. Meaning and description: Meaning of MARC; Prelude to MARC cataloging: Logical record structure; MARC cataloging elements: Logical data; Frequently asked questions. Asoknath Mukhopadhyay is formerly the Librarian at IIMC Kolkota, India.